Cockburn, a former investigative journalist, was always the right candidate to local Democrats, but the national party was late to provide support. The Democratic Congressional Campaign Committee only added Cockburn to its Red to Blue program for strong recruits last month. She still faces long odds against Republican distillery owner and Air Force veteran Denver Riggleman in a district President Donald Trump won by 11 points in 2016. Inside Elections with Nathan L. Gonzales rates the race Likely Republican. Cockburn and the Democratic Party have poured millions into the district in hopes that she will be the first woman elected to Congress in Virginia’s 5th. She has outraised Riggleman 2:1 so far this cycle — $2.8 million to $1.4 million through Oct. 17 — but she started running before him. Riggleman entered the race after freshman GOP Rep. Tom Garrett announced in late May he would not seek re-election as he addresses an alcohol addiction. The Republican candidate says he did not spend a dime to win the party’s nomination to run for the seat. Cockburn, meanwhile, had been running before Garrett decided to retire and was competing against other Democrats for the party’s nomination. Democrats opted to hold a caucus nominating convention for the seat over a traditional primary. Cockburn doesn’t think money will be the deciding factor in the race. It’s her efforts to build a grassroots network of supporters and volunteers in all the district’s 21 counties that she believes will help get out the vote on her behalf. In the final stretch of the race Cockburn held events in counties across the district — like one here in Madison Friday morning — to get volunteers to sign up for canvassing and phone banking. Kaine headlined a get out the vote event with her in Charlottesville Thursday, and on Friday Cockburn was joined by former Rep. Tom Perriello, the last Democrat to represent the district, and Ben Cullop, who ran against her for the party’s nomination. Meanwhile, Riggleman held events with high-profile Republicans. House Majority Whip Steve Scalise and Wyoming Rep. Liz Cheney campaigned for him Thursday night in Lynchburg and White House Press Secretary Sarah Huckabee Sanders stumped for him Friday in Warrenton. 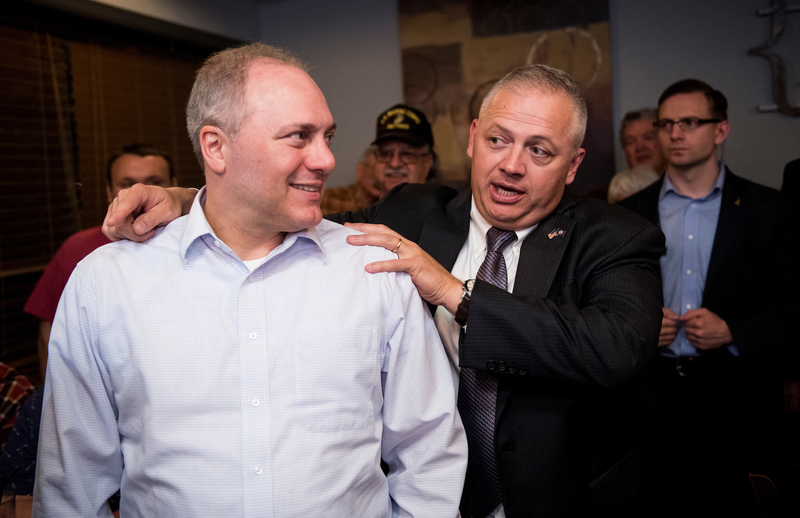 “Typically midterms don’t get the highest turnouts; I think we’re going to defy history in this election cycle,” Scalise said at the Lynchburg event, predicting a victory for Riggleman and House Republicans. Riggleman said he felt good about his prospects, despite not having a political background and having only been in the race for five months. He talked about his journey from being the oldest of eight kids that grew up on welfare to the owner of a distillery business. While Riggleman noted that his military career was always spent “behind the door,” he promised his congressional career would be in front of it. Cockburn also talked about transparency at her get-out-the-vote events Friday, noting that she’s got permission to remove the hinges to the door of her future congressional office so long as she puts it back. If elected, she plans to form advisory groups with constituents from across the district to provide input on major legislation. “We’re going to be in touch constantly,” she told supporters in Stanardsville Friday. Mark Heinicke, who attended that event, said that Greene County has always been a stronghold for Democrats in the district with its spill-over from the nearby college town of Charlottesville, but that the enthusiasm this cycle is unlike anything he’s seen before. “I’ve been canvassing since 2008; I’ve never seen anything like it,” he said. Volunteers in Madison and Fluvanna Counties said the same thing, citing voters’ frustrations with Trump and his rhetoric and concerns about health care. “They’re seeing that the Republicans are not stepping up,” Locusdale resident Ann Ridgeway said of her interactions with voters in Madison County. While the county will never be blue, she said there are some independent and Republican voters she met that are planning to vote for Cockburn. But Republicans in the district aren’t worried, saying Riggleman has done well raising money and messaging. One of Riggleman’s best assets is how well he listens, said Melvin Adams, chairman of Virginia’s 5th District Republican Committee. “When he connects with people and you take him out and introduce him to people across the district, he’s authentic, he listens, he engages and then he takes those conversations and he truly implements them into how he can help people in the district,” Adams said. John Miska, a veteran who’s known Riggleman for several years, said his experience in the military and as a business owner have provided him with experience that would serve him well in Congress. “He has management skills that have been tried and tested,” he said.